With around a billion passengers a year, more than 250 miles of track, literally hundreds of stations and a history stretching back nearly 150 years, the world’s oldest underground railway is a familiar place to those who use it daily - but actually how well do they know it? Did you know, for example, that regular Tube commuters can experience greater levels of stress than a police officer facing a rioting mob or a jet pilot going into a dogfight? That feral pigeons frequently travel by train into central London because they know the pickings are richer ‘up west’ than in the suburbs? That William Gladstone and Dr Barnardo are the only two dead people ever granted permission to travel on its trains, or what happened when someone got off the train leaving behind 250 lbs of sultanas? Whether you’re a commuter or a train buff, a first-time visitor or a live-in London junkie, The Little Book of the London Underground is the funniest and most fascinating guide to the world's oldest, strangest and most extraordinary underground railway, a rich compendium of essential trivia, bizarre but true facts the sort of irresistible lists of nonsense that few of us can resist. 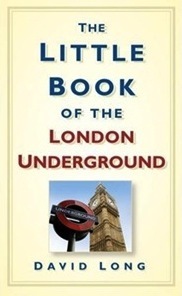 "Facts to fascinate about the London Underground." "If you thought you were a pretty switched on Tube terrier, have a read of this enlightening little book to see how much you really know."